Hope this doesn’t insult in any way, but you have been misinformed concerning the nature of Leviathan, listed as one of your Demons. The “Apocryphal” book of Enoch (one of the latter sons of Adam and Eve) is not included in the Holy Bible, primarily because the contents cannot be verified historically. He did exist(can be verified) but never contributed to religious or historical document except in the Bible books of Genesis, Exodus, and Leviticus. What makes the Bible so fascinating is that every act that is recorded is considered historical fact, even by other Middle Eastern religions ( Muslim and Islam). 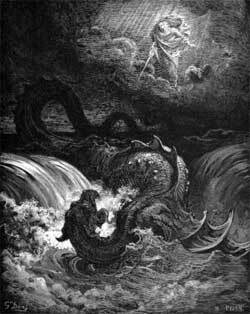 That said, Leviathan was spoken of in Job 41 and in other places in the Bible in a way that is known as “types and shadows” or figuratively. These representations, when properly understood, are meant to give epiphanies and revelations of Biblical principle that cannot be revealed by a story told in blatant text. Leviathan is Satan, Lucifer, The Devil, Old Slewfoot, whatever you want to call him. He inhabits the “sea” of Humanity, Or the portion of this world that has not been redeemed by Jesus Christ. In Isaiah 27, It is foretold of his reign being brought to an end in the time that God ordains (once certain prophesies are fulfilled). Regardless of personal religious belief, this is just the interpretation the Writer intended. Hope I haven’t been offensive! I will respectfully have to disagree with you that everything in the bible is historically accurate – in fact most biblical scholars would disagree with you on that point. For an excellent treatise of the history of the Israelites, I will refer you to The History of Ancient Palestine by Gosta Ahlstrom from the University of Chicago Divinity School. The Book of Enoch was considered a prominent Jewish book in some Jewish circles during the 2nd Temple period. We know this because a high number of fragments of this document were found among the Dead Sea Scrolls – therefore, (pre-Christian) Qumran community thought this book to have some value. One can even argue that there are references to this book in the New Testament itself (for instance 1 Pet 3:18-22 – see John A. MacCulloch’s Harrowing of Hell or many of the early Church Fathers who did know of and write about 1 Enoch in their commentaries). But again, there were a number of Jewish movements during that time, and the apocalyptic movement (potentially the Essenes – see Gabriele Boccaccini’s Beyond the Essene Hypothesis was not the dominant one. Why the Book of Enoch was not included in the Biblical cannon when other apocalyptic texts from the similar tradition – Daniel and Revelation – is a different matter, but simply because it wasn’t included in the Bible does not mean it wasn’t an influential book during the birth of Christianity. Regardless, I am not approaching this from a matter of faith, but historically – from all evidence (primary texts, secondary writings, archaeological evidence) that we currently have. I am a historian – my degree is in 2nd temple Judaism and Christian Origins – so I look at the evolution of a belief – how people interpreted something in ancient times often differs from our modern interpretation. For instance, many would argue that specific deities from the OT – like Leviathan – actually had earlier origins in Canaanite myth. (See Norman Cohn’s excellent study for more info: Cosmos, Chaos, and the World to Come) You may interpret the character of Leviathan in the way you understand, but that doesn’t necessarily mean that the author meant for it to be interpreted in that way and in connection with other books. There was a particular set of beliefs about this being at that time, and he wrote with those beliefs in mind. However, beliefs and interpretations change and to get a sense of what “Leviathan” as we now know it to be is, we need to look at various other perspectives as well – Biblical or not. I did not take offense to your inquiry nor attack your faith, but from my perspective, you are looking at the matter from a very limited perspective. And I should point out that everything I’ve mentioned above would be standard course of study for anyone attending a good Rabbinical or Divinity school – this is mainstream religious scholarship and all the books I’ve listed are by well respected professors. Previous Post: « Reader Q&A: Gnostic Catechism – Why Are Some Things Unknown?